Why You Can Trust Self Storage When It Comes To Your Stuff | McKee-Horrigan Inc. Sometimes it’s easy to lose track of just how much stuff we have. There are a few holidays every year that often bring an influx of presents: Christmas, our birthdays, Valentine’s Day, Easter, Mother’s and Father’s Day… Every year, it seems that we have more and more stuff and less and less room. This is especially true for people who have some kind of interest or hobby that requires materials or physical objects. Bookworms have experienced the frustration of having to sort through dozens, if not hundreds of books every time they have to move (and boxes full of books aren’t easy to carry!) Movie fans have shelves that are creaking under the weight of new releases and old classics in Blu Ray cases. Artists have to dig through old sketchbooks and paint jars in order to find the specific brush they’re looking for. When you’re dealing with all of this stuff, it’s easy to become overwhelmed and feel a little claustrophobic. Having the things you want in life and the means to afford them should be freeing, but instead it just seems to bring stress. Canadians are quickly realizing that holding all of their goods at their home isn’t always a sustainable or smart solution. Instead, they’re turning to self storage. Self storage combines the convenience of garage storage at home and size of a warehouse. Are you still not sold on this idea? Despite the rising popularity of this concept, not everyone is convinced. Some homeowners have concerns about garage door security and how its handled in such a facility. Others are worried they’ll lose their precious goods and sentimental items to external elements. We explain why having the garage doors and security of an industrial setting makes self storage the best long term solution to containing your excess goods. Earlier, we mentioned all of the hobbies that take up space in your home: arts and crafts supplies, movies, books, clothes, and so on. There are a few reasons why Canadians are starting to feel like their homes are stuffed to the brim. First of all, storage is becoming a premium luxury in homes. A house with storage rooms and wide open closets can command a much higher fee on the market than another home that lacks those same accommodations. This trend is likely to only continue as Canadians are willing to pay more for extra closets, basements, and attics. Before long, your average family will be “priced out” of a home with a great deal of storage space. Secondly, many of the extra goods people hold onto aren’t suited for the landfill. People often suggest you simply toss your extra stuff, but that has complications. As an example, someone who is starting a family and is in the process of raising their first kid will eventually end up with a redundant set of baby furniture, clothes, toys, etc. However, it makes sense to save most of these items for the next baby (and other items that hold a great deal of sentimental value). Sketchbooks that are filled to the brim are a valuable tool for artists, and avid readers will want to hold onto their favourite novels to read again one day. Therefore, it makes sense that self storage is on the rise. 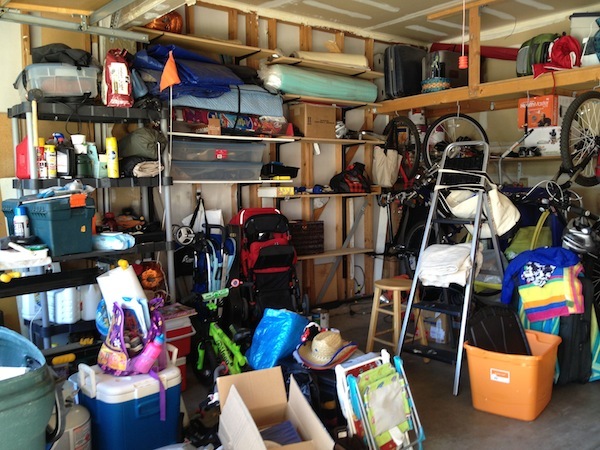 Why does self storage trump your garage at home for storing extra good and items? There are a few reasons. First, your garage is smaller and less secure by nature of being part of a residential building. On the other hand, garage doors on an industrial building are excellent for keeping intruders out. Self storage facilities are also much larger and can handle the things you need to store without a problem. Secondly, you may need your garage for other things – housing a car, storing the kids’ sports gear, or other things you need on hand. By having multiple storage solutions, you’ll reduce your stress and increase your ability to prepare for anything. Finally, using self storage lowers the amount of room taken up in your home. Many people freeze and shut down when faced with mountains of stuff, no matter how well organized. Using an external facility is a smart way to sort through your items and keep your organization manageable. Many Canadians are hesitant to try out self storage because their belongings are so precious to them. The idea of possibly losing their sentimental items or having their goods damaged is terrifying to them. However, they put their items at risk by keeping them at home instead of using self storage. Self storage facilities are well equipped to keep any threats out, whether they are intruders and thieves, dust and mold, or sun, wind, and rain. A garage door designed for industrial use is durable, sturdy, and strong enough to keep your goods safe through wild weather. As for the human element, intruders are kept at bay with garage door security tools like biometric scanners and alarm systems. Are you feeling like you have less and less room every day? Do you dread every trip to buy new items because you’re not sure where to store them? This problem is more common than ever, and self storage is becoming a popular way to solve it. If you’re worried about the security and safety of your items, self storage is the smartest solution. Sturdy garage doors and an industrial setting mean that the elements or outside intruders have no chance of getting to your valuables. If you’re a homeowner with questions about residential life, from home improvement to maintenance, visit the McKee-Horrigan Inc. blog. We provide an expert perspective on many facets of homeownership and common problems you may be facing.